I love ’em… Who doesn’t??!!! It’s the other thing that I hardly prefer making them… But on some occassions, it works great! After all, too much control on cravings isn’t good too, what do you say? Take all the ingredients together in a big bowl and mix well to make a lump-free batter. Heat oil in a deep vessel. Add 2 tsp of it in batter before you start frying. Take 2 spoons and fill one with batter, drop it carefully in hot oil. Repeat the same technique 5-6 times in batch. Deep-fry until they are golden brown in color and crisp in texture. Take them out on an absorbent paper to drain excess oil. Serve hot with Amchur Chutney! Adding oil in batter make it absorb less oil while frying. It doesn’t look oily n sticky at the end. Similarly, you can use sliced potatoes, ripe bananas, capsicum, ajwain leaves etc. for making pakoras. I want these in my mouth right now!! 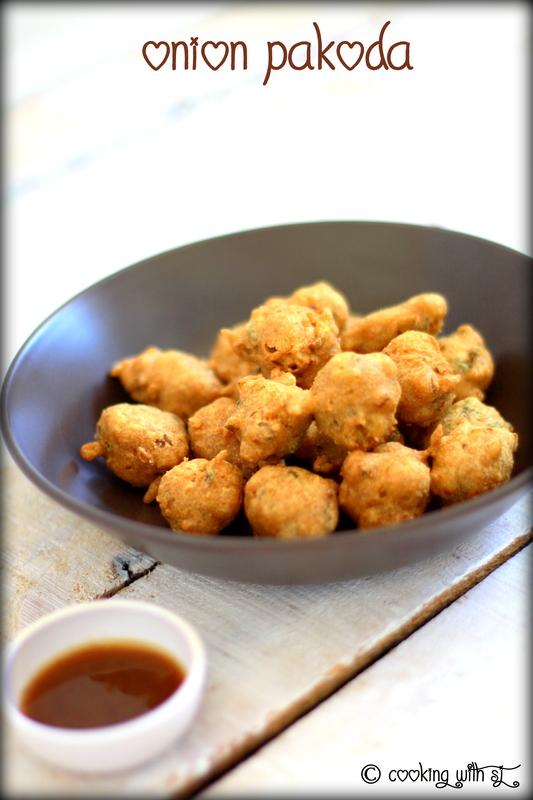 haha extra jim for eating pakodas ….Not at all i love enjoying this suring lovely weather but no extra walk or jim hehehe .These look fabulous shruti…..
my hands would be perennially raised for food like these! ;) yumm.